Airlines based in the Arab states of the Persian Gulf have been buying up huge fleets of the biggest planes around—the Airbus 380 and Boeing 777. Some of you have asked me what’s going on with these lines—their home countries are very small and don’t generate much outbound or inbound traffic—and why they are growing so big, so fast. Because this is a slow week for travel news, it’s a good time to look at one of the more interesting developments in international aviation. Emirates, based in Dubai, United Arab Emirates, is the elephant in the room. It has ordered more of the giant A380s and Boeing’s popular 777s than any other airline, anywhere. 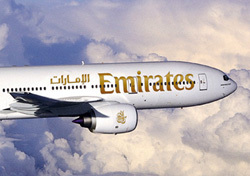 Etihad, based in Abu Dhabi, United Arab Emirates, is also buying up lots of the biggest planes. Qatar Airways, based in Doha, Qatar, like Etihad, is catching up rapidly. Their home countries are economically important as banking and commerce centers, have lots of oil, and enjoy some of the world’s highest per-capita incomes, but none has either the base population or the tourist centers to warrant such a huge airline operation. And local origin/destination traffic isn’t the target market. Instead, these airlines are betting big on operating as giant hubs between Europe and Asia/Oceania. And so far, this strategy is working. You’re familiar with the pattern here in the United States. All three of the giant legacy lines operate one or more hubs somewhere near the middle of the country—American in Chicago and Dallas, Delta in Minneapolis, Detroit, and Atlanta, and United in Chicago and Denver—where they can collect and connect traffic from major cities to the east and west and provide flights from almost everywhere to almost everywhere with one well-timed connection. That’s what Emirates, Etihad, and Qatar are doing on a longer-range scale. They fly nonstop to their hub airports from a bunch of cities in Asia, the South Pacific, and East Africa; exchange traffic in those base cities; and fly the connecting passengers to Europe and North America. To be sure, some of those routes are busy enough to warrant nonstop flights, but many combinations require hubbing somewhere, and the Persian Gulf is an ideal location. A case in point is the new agreement between Qantas and Emirates. At present, no transport plane can economically make it nonstop between eastern Australia and most of Western Europe—London-Sydney is probably the only route in that part of the world that could support frequent nonstops, in any case. So to serve such markets as Amsterdam, Frankfurt, and Paris, Qantas has to stop somewhere, and the airline’s current pattern of stopping at Singapore and Hong Kong hasn’t worked well. So, Qantas will probably stop flying to many European cities other than London, and will instead fly to Dubai, where Emirates will take passengers the rest of the way. And it doesn’t hurt that Emirates generally rates higher than Qantas for service. Obviously, travelers between America and Eastern Europe won’t go as far out of the way as Dubai for a connection. But if you’re headed for the Indian subcontinent, the Middle East, or West Africa, you may well find your best itinerary will connect through one of the Gulf hubs. Over time, nonstops in such ultra-long-range planes as the newest 787s may erode the connecting markets, but only a few will have enough traffic to support daily nonstops. And the big Gulf carriers hope to pick up much of the rest.